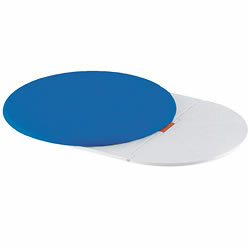 Blue transfer board with rotary seat to aid in transfers from wheelchair to bathlift. The rotary seat with transfer board assists in positioning to center of lift seat. The center disc pivots and slides on base plate. 21"L x 12.5W.